Councillor Ciaran Cuffe said there is strong academic evidence that this move can save lives. DUBLIN CITY COUNCILLORS have approved the introduction of a 30km/h speed limit on all residential roads within the canal ring of the city. In a vote last night, 37 councillors were in favour, eight were against and two abstained. Speaking to RTÉ’s Morning Ireland today, Green Party councillor Ciaran Cuffe said the new by-laws will come into force on roads inbetween canals on 31 March. At the end of May, a number of other residential areas will also see a change to the 30km/h limit. “The reason for it is that it’ll save lives. There is a lot of strong academic evidence saying that if people are driving slower, less people will be killed or injured,” Cuffe said. “Simply changing the road signs does work – you get a significant change,” he said. 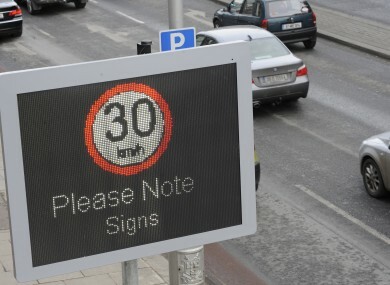 Email “30km/h speed limit approved for some Dublin city roads ”. Feedback on “30km/h speed limit approved for some Dublin city roads ”.